How to Recognize a Strong Work Ethic? Recognizing a strong work ethic is a key for differentiating top performers from average job candidates. Candidates with extensive relevant experience and the right skills won’t be an asset for your company unless they exhibit a strong work ethic. Learn the most effective ways to recognize a strong work ethic in your candidates! Work ethic definition: What is the work ethic? 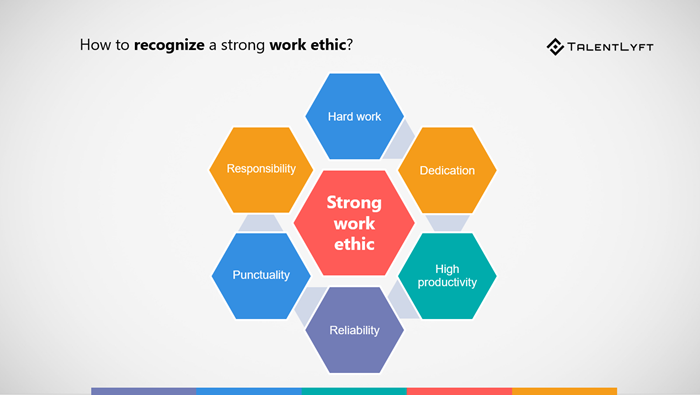 Work ethic is a set of moral principles and values which guide an employee’s performance at work. 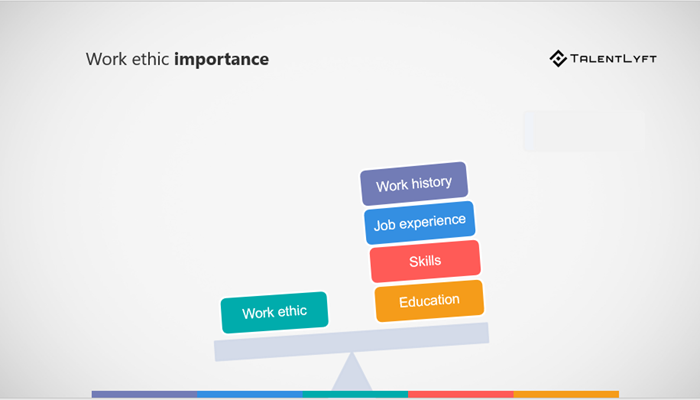 Work ethic determines what is good and what is the right moral choice in job-related situations. It is used as a guide for employees’ attitudes towards work and behavior on the job. ➡️ If you want to learn other popular HR terms and expand your professional vocabulary, download the Glossary of the most important Human Resources terms used by HR Professionals. What is a “strong work ethic”? The phrase “strong work ethic” is used for an employee who exhibits a set of values and belief in work as a moral good. This means that employees with a strong work ethic are intrinsically motivated to perform their best. A strong work ethic is reflected in employees desire and determination to work hard to meet their job’s goals while adhering to the workplace policies and rules. Employees with a strong work ethic are hard working, dedicated and reliable to deliver their best work on time. In short, employees with a strong work ethic are those who are motivated and work hard and smart. Having employees with a strong work ethic is critical to a company’s success. According to research, employers often cite a strong work ethic as the most desired characteristic in a new employee. Today Express Employment Professionals, the largest franchised staffing firm in North America, released findings that reveal what traits are most important when hiring a candidate for a job. Respondents were asked to rate various traits on a scale of one to five based on how important they are when evaluating applicants. Work ethic topped the list with an average rating of 4.45. Many expert studies have shown that a strong work ethic results in excellent work performance. Companies whose employees excel in their work performance have a significant advantage in the market. Thus, companies whose employees have a strong work ethic are more likely to achieve their goals and achieve higher revenue and profit. When you’re trying to recognize a strong work ethic, it is important to look beyond your candidates’ qualification and skills. You should dig deeper and try to assess if a candidate has relevant traits and characteristics needed to be productive and successful at their job. Employees with a strong work ethic are hard working; they often go an extra mile to excel at the task. Employees with a strong work ethic are dedicated to their job and often goes above and beyond what was required initially. Employees with a strong work ethic tend to be more productive and efficient with their time. Employees with a strong work ethic are reliable; you can rely on them to get the work done. Employees with a strong work ethic always respect deadlines and finish all their tasks on time. Employees with a strong work ethic adhere to workplace policies and rules and take responsibility for their behavior. In short, you should be looking for a top performer who is intrinsically motivated to deliver high quality work consistently, on a daily basis. How to assess work ethic in a resume? You can’t really assess a candidate's work ethic by resume alone, but you can identify information that indicates that a candidate is a top performer. Look for rewards and recognition in a candidate’s resume. Promotion is also a good sign of consistent and dedicated work. How to assess work ethic in an interview? You can assess the candidate’s work ethic more accurately in a job interview. The best way to do it is by asking open-ended behavioral questions. Behavioral interview questions require candidates to draw upon their past experience. Ask your candidates how they reacted in a certain past situation can reveal a lot about their work ethic. Studies have shown that the best way to predict future job performance is to ask about past performance. Pose questions to find out what they did in a certain situation. Make sure you ask candidates to provide detailed, real-life examples to support their answers. What does “hard work” mean to you? Walk me through a week when worked very hard. What motivated you to work so hard? Tell me about a time you did something because it needed to be done, even though it was not your responsibility. Describe a time that you felt overwhelmed with your workload and how you handled it. How do you prioritize your tasks? What time management strategies do you use? Give me an example of a situation when you failed or made a mistake at work. How did you handle it? Name three accomplishments you are most proud of. Give two examples of what you did in previous jobs that demonstrate your willingness to work hard. Describe a time when you were asked to work overtime without any additional compensation. Did you do it? Why? Tell me about a time when you were proud of how hard you worked on a project. Keep in mind that finding and hiring candidates who exhibit a strong work ethic is just the first step you need to take in order to ensure your company’s high productivity and revenues. If you want to keep your best employees motivated, you should learn how to motivate your high performing employees.